It's cold in Hungary, I tell the inquiring Canadian colleagues, but before I could go any further and tell them how much I'm looking forward to those few centimetres of snow, they reply 'Oh yes, it's cold in Canada, too'. About minus 30 degrees Celsius. 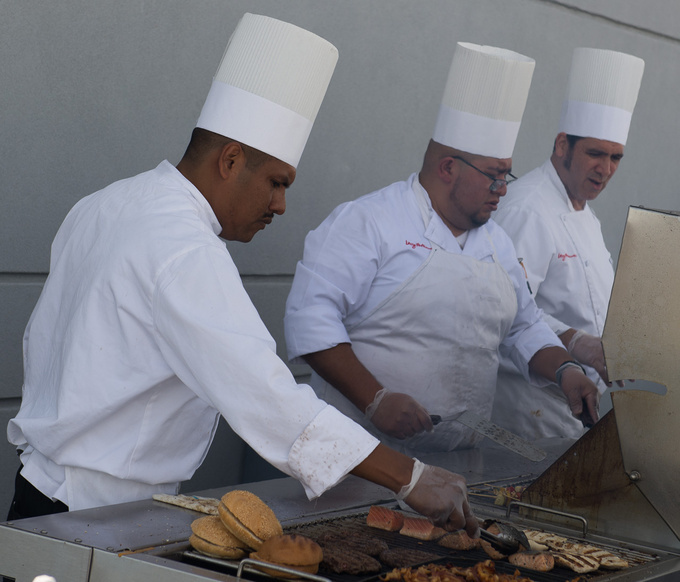 The chilly weather back home doesn't bother any of us at this very moment, though, sitting on the patio of the Las Vegas Speedway, trying to smash the remains of the burgers made by a talented Mexican troop. It must be 20 degrees Celsius and the sunshine is pretty strong on this day at the end of January. The establishment opened in 1971 as a substitute for the Stardust Raceway closed earlier. The main attraction is of course the 2.41 km oval track, but there’s a dirt track and a quarter mile drag strip here as well. The whole arena is surrounded by a huge bleacher seating 142 thousand. Due to its coloured seats the upper section looks full even when there is no one around. Like now. (I hope someone competent is reading this in the midst of the current stadium-building craze in Hungary and takes measure in time in connection with the seats.) 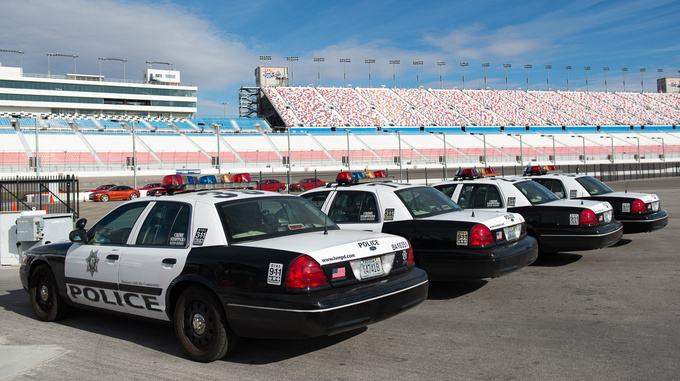 BMW rented the winding oval track (approximately the size of the track at Kakucsring) for the launch of the Series 2 coupé and the Series 4 convertible, apart from us there are only a few Vegas cops present waiting for their turn on the driver training track right now. Unfortunately we can’t see what they’re practicing, as they’re mooching about even more leisurely than us on this quiet morning. 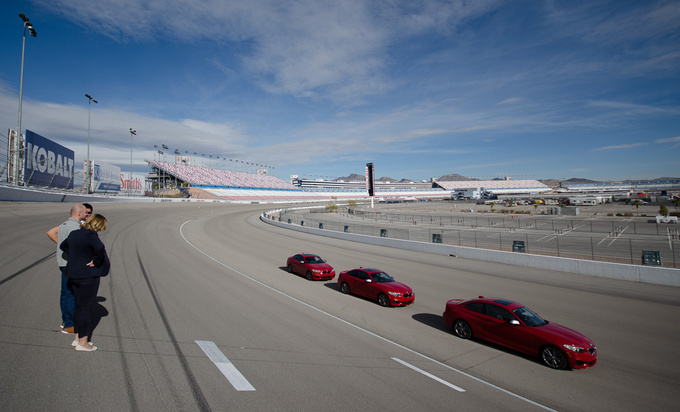 The Vegas leg of the Nascar race will be held in March. It’ll be hot by then, but still bearable. It’s now the end of January, 10 a.m., and the sky’s a bit cloudy. I get in the Series 2 coupé, lower the window, and the moulding strip burns my lower arm as I rest my elbow on it. I know, there are places where it’s warm in winter, but having your arm burned by the sun in January is more than I can take. This climate is no easy shakes, but at least the Canadians seem happy about it. BMWs rarely surprise me. The models are incredibly uniform visually, quality- and even driving experience-wise. The X5 obviously behaves like a big BMW, and the Series 1 like a small one, don’t expect big surprises. Most journalists could write their review without even attending the event. Sometimes a BMW looks out of place in the line-up, like the sporty Ms, but even that is down to having received a few more drops of the magic potion: the BMW essence. They hardly ever astonish me. One of the few that did was the 1M, which simply blew my mind with its ease and informality. The power, the sound and the incredible character of the engine were only extras. We have plenty of time to kill eating hamburgers on the terrace until 4 p.m., when the test driving of the Series 4 convertible kicks off. In the meantime we’re entertained by the military airport nearby. Planes are taking off every 2 or 3 minutes… Gosh, is that really a Raptor?? A Raptor!!! Hell, nooooo! And another one! And one more! What is this, some kind of reunion? As a matter of fact, it could be their 24th anniversary party, as the first stealth fighter took off in 1990. Of course this is not just any military air base, but the Nellis Air Force Base, where the US and some better-off allies come to practice. That’s why MiGs and Sukhois take off at times. They play the role of the intruder, the BMW instructor saw lots of Russian stuff last week. We see two B2 stealth bombers, F15s, F16s, Boeing E3 AWACSs, and another one, and one more. I smell trouble. I’m breaking the unwritten rule that says if you write about sports cars, you need to write at least two paragraphs of medical babble about neurons which the stimulus rushes through at the speed of light, all this crowned by some newly fabricated simile (or metaphor?) about how some body part of yours got a dent from the crazy speed, but I’m sorry, I won’t be doing that. I’m suffering from such a bad migraine that the word synopsis only makes me think of headache, and by the time I’m done with it after drinking two litres of water, the course is over – three laps and one to cool off. 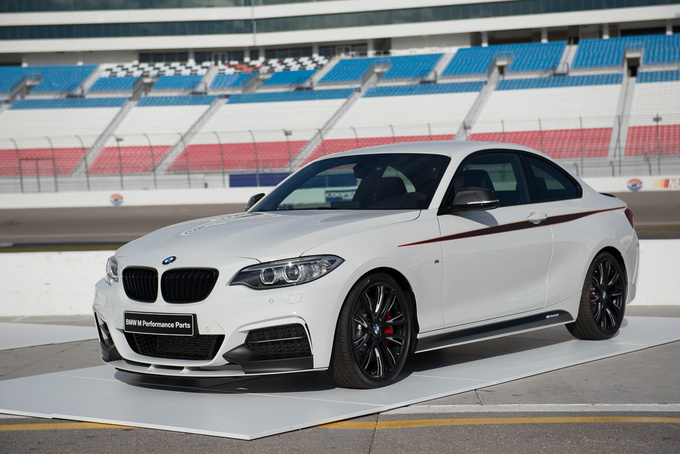 My main impression is that the M235i is not the successor of the M1, just a very powerful version of Series 2. 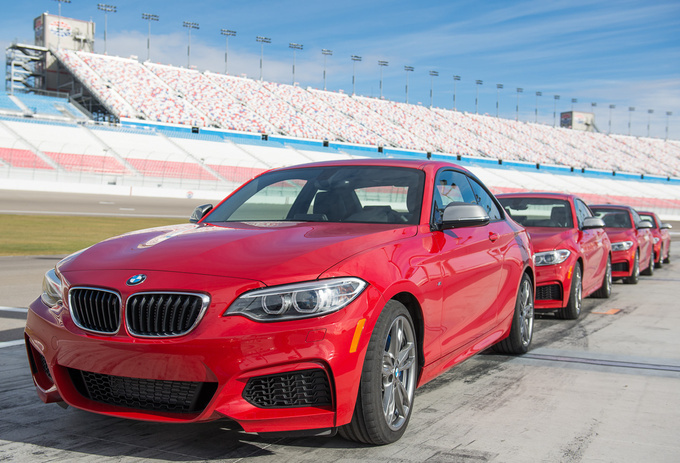 It’s nice of BMW to have arranged a race track test driving for us, even if the folks knew that an asphalt of this size, with such small curves won’t become this car. It’s dull and reluctant. You can drive it fast, but it doesn’t feel good. I had cosmic luck with the M1 – I had some vacuous motorways of Scotland all to myself driving it once, then I drove it once more on the Slovakia Ring. Two places where it shines. 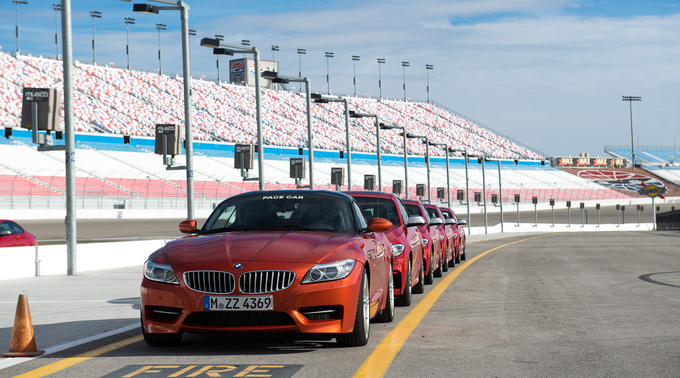 No M2s have been brought to Las Vegas, though. 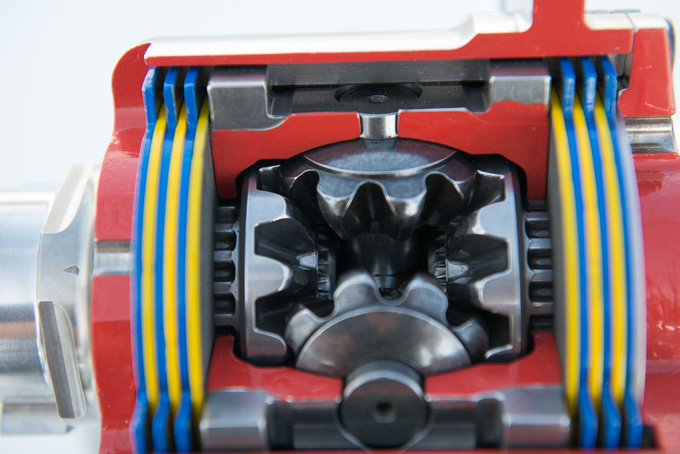 The only one in white is just for show, its limited slip differential, which is mechanic, is presented next to it, and thanks to the cutaway we can even count the tooth of each gear. 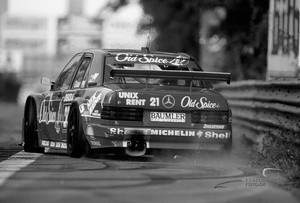 What does it feel like to drive in a 20 degree banking turn on an oval track, I hear you ask? On one hand, it’s funny, on the other it was obviously not made for the pensioner speed of 160-180 km/h which we are doing. I did not know that in Nascar you had to dash through small gates, short white lines painted on the ground, which is not so easy in a race car. 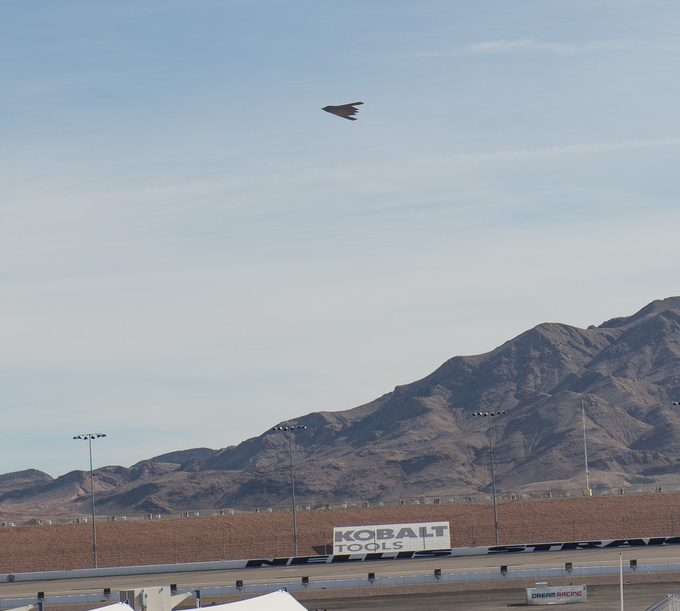 Especially while you’re busy reading the signs, like Kobalt Tools and Nellis Straight. On the oval track we could perhaps watch the drag, which is said to have become better (Cd 0.29), but then the same figure had been published about the 2008 Series 1, so either someone made a mistake or the figure has been rounded up by one or two thousandths. At least I can have a drive around town. If I had been given a car with a manual gearbox, it might have defeated my headache, but it takes minimal concentration to drive this one with the 8-speed automatic gear. Driving around this small track wasn’t a blast anyway, not even the way I did it: we were not told not to turn the ESP off, so I did, because as far as I’m concerned anything that isn’t forbidden is permitted. The car corners nicely, really, it has power kicking itself along, the traction is good, but one thing it definitely lacks is the fantastic INITIMACY of the 1M. See? I just used the magic word which you can’t get round if you want to keep up with the Anglo-Saxon motoring press slang. I feel much better now about having missed the babble about the hypothalamus. The agglomeration of Las Vegas gives you the impression that people around here do nothing but stuff themselves. Judging by what I see they don’t buy clothes, they don’t buy cars. You see nothing but McDonald’s, Wendy’s, and billions of Rigo’s Taco Lo Mejor. That’s what’s on my mind when I realize I won’t be able to do the regular motorway testing: in the US, you can’t set the driving route when using the navigation. You can’t set fix locations of the route. I don’t quite grasp this, but the people at BMW said that’s how it goes. So people eat instead. And gamble, obviously, as you even spot a casino here and there in the outskirts of the city. There must also be some regulation that beggars must wear silly caps. Something knitted in South-America or perhaps a small, tight thingy. Stopping at a red light I have a look at the dashboard. 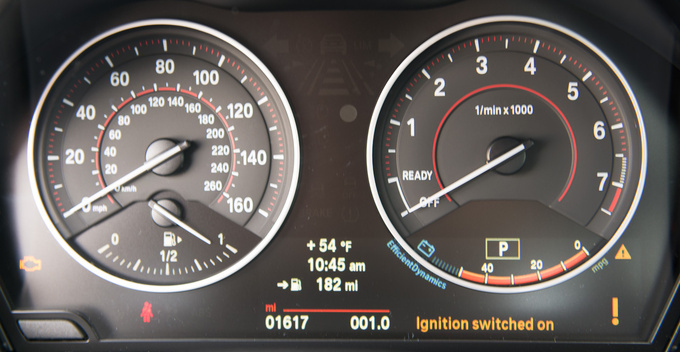 BMW seems to have committed itself to using fixed monitors that stand out from the dashboard. Now, I’m a huge fan of the design team of BMW, but this is an assignment even they have failed at miserably. Even in the Series 4 and the X5. At least the monitors have gotten larger, with some being even 8.8 inch. Of course in the case of the BMW 2 I’d rather spend the monitor money on something that makes more sense – a more powerful engine, shinier rims, anything, really, as any smartphone is better at navigating and playing music. And even a phone holder fastened to the windscreen by a suction cup wouldn’t look more hideous. Then I find myself in the Vegas wedding area, here’s the infamous Graceland Wedding Chapel, too, and it looks like you need to be totally hammered to get married around here. And it had better be dark when you do, because these chapels look no different from a doghouse in Mombasa. As for the American-speaking sat-nav, there’s only one thing to say: epic! 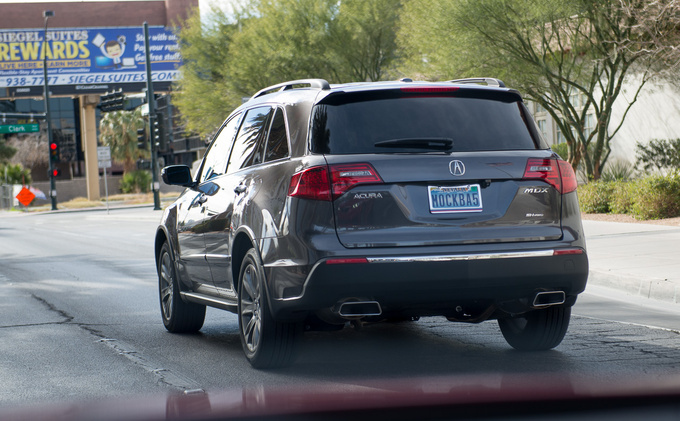 Please turn right after a quarter of a yard, then drive 300 feet and turn to the left. It isn’t easy to get used to the customary system used in the US. You really have to be born here to make out the consumption of a car by seeing a figure given in mile per gallon ratio. The distance and the liquid measure are even given in reverse order, and one figure is about 1.6, the other 4 times as big as the metrical they refer to. The econometer below the tachometer is no good, either. More is less - you’d do zero miles with full throttle. Of course the liquid measure written on the bottle of the ice tea I’m sipping tops all of this: 20 FL OZ (1.25 PT) 591 ml. Ml needs no explanation, even the 1.25 pint is clear, but should you light-headedly decide to cook something following an American recipe, please note that FL OZ stands for liquid ounce, and you have to measure the required amount of flour using a different measure. I’m perfectly content with today’s design, I mean that of the beginning of 2014, as I walk along the new neatly lined up coupé 2s. There’s just one thing that doesn’t become them: the Z4 parked first in line, which even has a hotter colour than the rest, but that’s what it’s for: to be hot, so let’s not be too hard on it. Adrian Van Hooydonk is the good cop in the modern history of BMW – the models in the current line-up all go together. Chris Bangle was the bad cop, but as such he was perfect. I admire him for showing BMW the way out of the design deadlock of the late ‘90s, and I have sung the praises on him before. True, shaking something up is always a bit cruel, and Chris wasn’t prissy when he got to work. Take his Bangle 7 facelift, for example. Its rear is what design kids get threatened with if they don’t want to eat the spinach. And its front, too. The series 5 and 7 classical look works better these days. The revolution is over and it’s time to calm down again. As has the Series 2, if we look at it as the logical extension of Series 1. Series 1 had something beaver-like about it. The kidneys morphed into nippers, and the suggestive gaze seemed to be on the lookout for trees fit for building dams at all times. The Series 2, out in March, is in keeping with the BMW image. Calling the model 2 instead of 1 is justifiable: it’s 7 cm longer, 3 cm wider than the Series 1 model, the wheelbase has been increased by almost just as many (2690mm), and the boot is now 390 l without making the people sitting in the back admit to having taking part in all kinds of terror acts thinking they are being put to the rack. Las Vegas is not a nice place to be, at least not for me, tending to lose the thread after a few minutes even when playing cards at family get-togethers. I simply do not care about it. It looks just what the earth would look like if instead of amino acids concrete and neon had started boiling a couple of billion years ago. 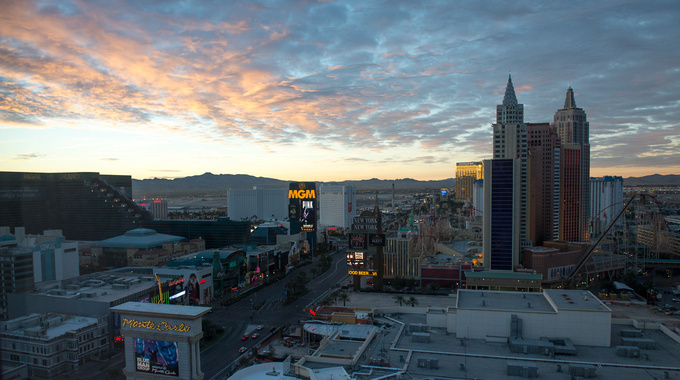 Skip the dinosaurs, and you’ve arrived in Las Vegas. Maybe I could get into the habit of pushing buttons on slot machines or playing poker, provided I understood the point of it all, which I have not felt the urge to try. The only reason a tourist would ever come to Vegas is to play. I was desperate to find other attractions browsing the net, but found nothing. OK, I could take a look at Mike Tyson’s castle, which was featured in The Hangover, but a fence won’t do much me, I’m afraid. Not even knowing that here is a tiger behind it somewhere. Where does the owner come from, I wonder? Another famous Vegas resident is the arguably best boxer of the last decade, Floyd Mayweather, the unhittable welter-weight genius. So unbeatable is he that last time he was pressed against the rope by Saul Alvarez, something of a bookie’s favourite, he simply sashayed off giving the rope a theatrical, worried look as if to check it was okay (at 11:10 in this video). Owns a private jet, but makes his gorillas take another plane for fear of excess weight. Excess weight of the plane, obviously, as Floyd certainly hasn’t got any. He trains like a maniac, often getting up at 3 a.m., and while sleepy-heads simply miss their morning erection, he never wastes his natural testosterone high but rather converts it into a six-pack. Loves cash, often carries it around in a bag and even shows it off on Twitter. The Mayweather Gym does not welcome visitors. I can imagine it only being stated on the website to keep away idiots, maybe I could just walk right in. And slowly work myself up the ladder to take the position of Floyd’s bucket man. The week before this trip I went to see my mate Sixx, who had been to Vegas before, hoping he could give tips on what to see. He couldn’t. He confirmed there was absolutely nothing to see in this city, then put his earphones back on and continued to slam some TV-show. Blocks of concrete, at times with surprisingly good fronts. The 9 storey high Gibson Les Paul with strings flashing on the front of the Hard Rock Café is quite realistic even at closer inspection. The huge one half of a motorbike fastened to the front of the Harley Davidson Café does not give itself away, either, I’d even say it’s too lifelike. But it sure is obvious that every legendary building is basically just a flashy front of a block of concrete, especially seen from the 23rd floor of the Hotel Mandarin Oriental. 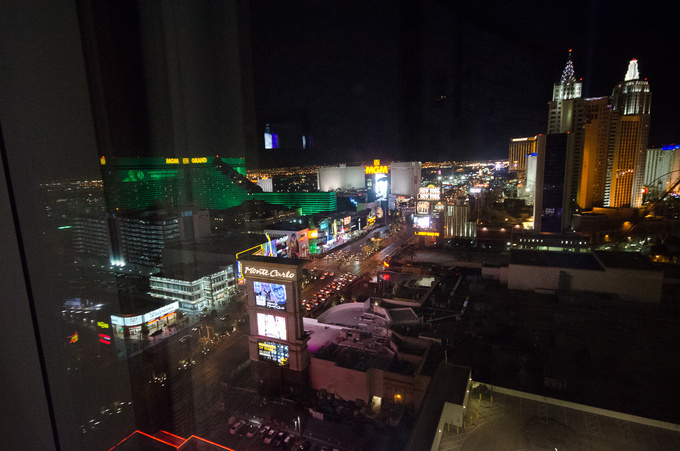 The famous buildings, like the Mandalay Bay, the Caesars Palace are all near each other in the inner city, surprisingly near the MacCarrant airport, to make things easy for celebrities. You can almost peek inside the windows of the Sahara or the Bellagio while landing. Leaving the inner city behind, though, there’s nothing but big, flat, one-storey buildings as far as the eye can see. What’s this good for? (Merely a rhetorical question, obviously. Clearly nothing). 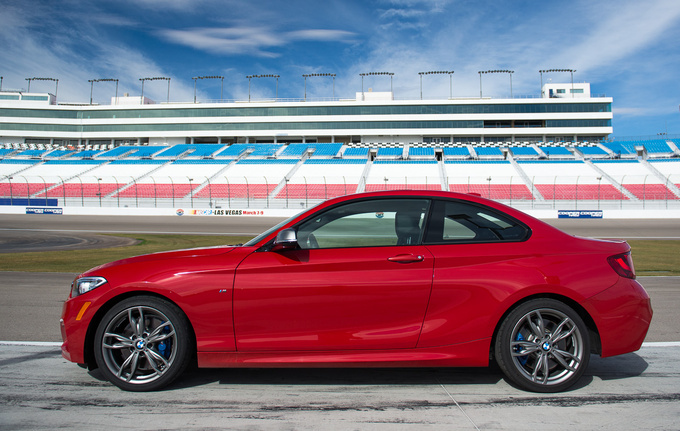 It is, however, not hard to guess why the BMW has decided to organize the international launch event of the Series 2 coupé and the Series 4 convertible here. Nice weather is a must because of the convertible and the 2 Ms are crying out for a race track. The make-up of the group of attending international journalists gives a clear picture of BMW’s preferred global markets. I seem to be the only one from our region. There are few journos from Italy and Scandinavia, quite a few from Russia and China, and plenty from the US and Canada. I have not yet seen the Mint Hotel of Fear and Loathing in Las Vegas fame. The Mint 400 motocross endurance race sponsored by the hotel is long passé, and the hotel itself closed in the ‘80s. Johnny Depp and Benicio del Toro were fooling around in a set. Anyway, the point is we can be sure that the BMW Series 1 isn't the only model to get a successor - the M1 will probably be one, too. 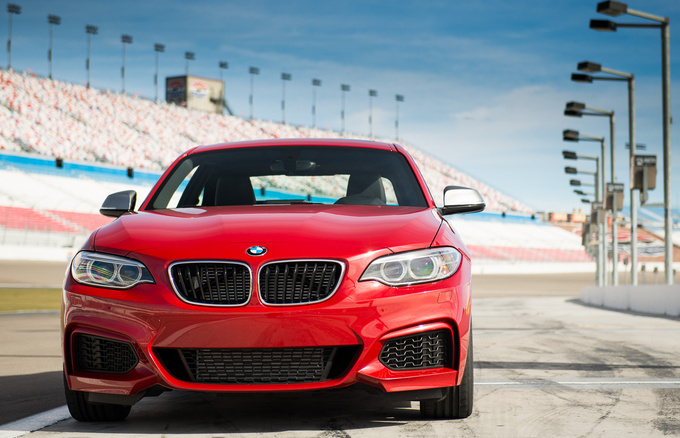 Because the M235i is only a good car. Never mind the 3-litre engine, the classic in-line six and the 326 PS, anyone who’s driven the 1M will only be left with an obtuse, but definite pain. A 2-litre, in-line four version called 228i, with a power output of 245 PS (between 5000 and 6500 revs), doing 0-100 in 5.6 seconds will be made. 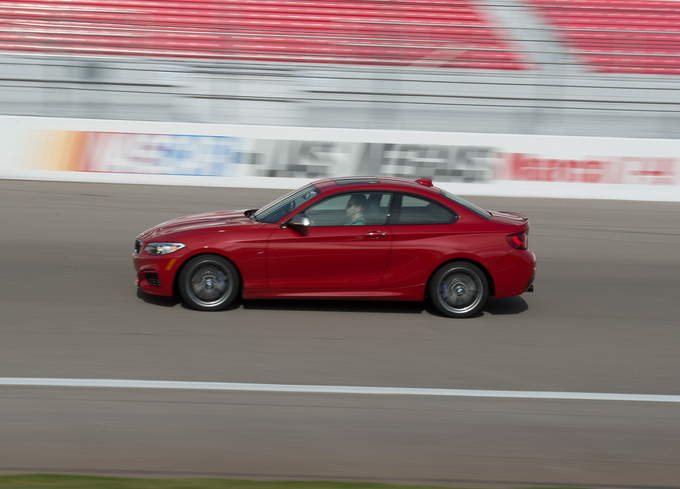 The 220i is an inline turbo as well, but has only 184 PS and a torque of 270Nm. We’ll probably get the diesels over here, numbered by the same logic. The more powerful 2-lite version will be called 220d, with 216 PS and a torque of 450 Nm, the more economic 220d will have 184 PS and a common rail pressure of 1800 bar. The consumers, of course, are hesitating for a while, then conclude, like I did the other day in a laptop shop, that the slower processor might just suffice, actually, hey, let’s see a cheaper version. 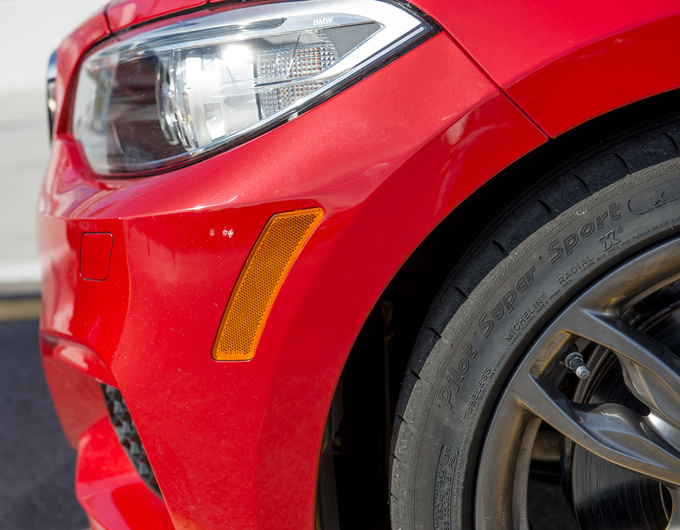 They are the ones the 218d Coupe was made for. Well, who says that the common rail pressure can’t be 1600 bar? A few years ago those were used in space ships, and an acceleration of 8.9 seconds is much better than that of an average car. I don’t envy the moderators of BMW forums who will have to decide whether the three engines are the same, and if yes, why not. 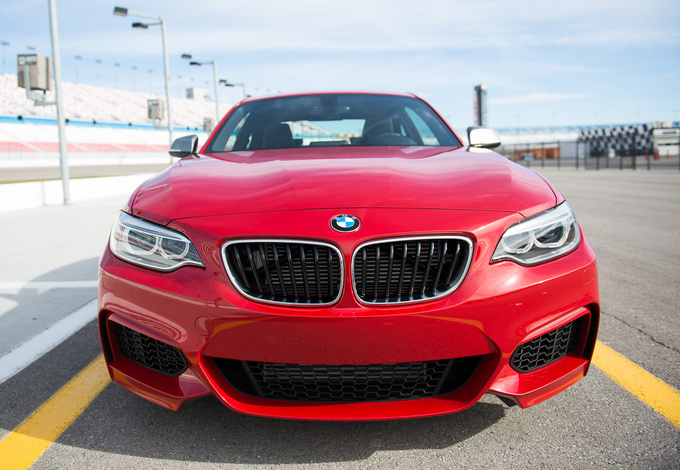 This car may not become the shiniest star in the BMW line-up, but it does have a subtle shimmer. Those were the days! Legendary pilots, reckless races.